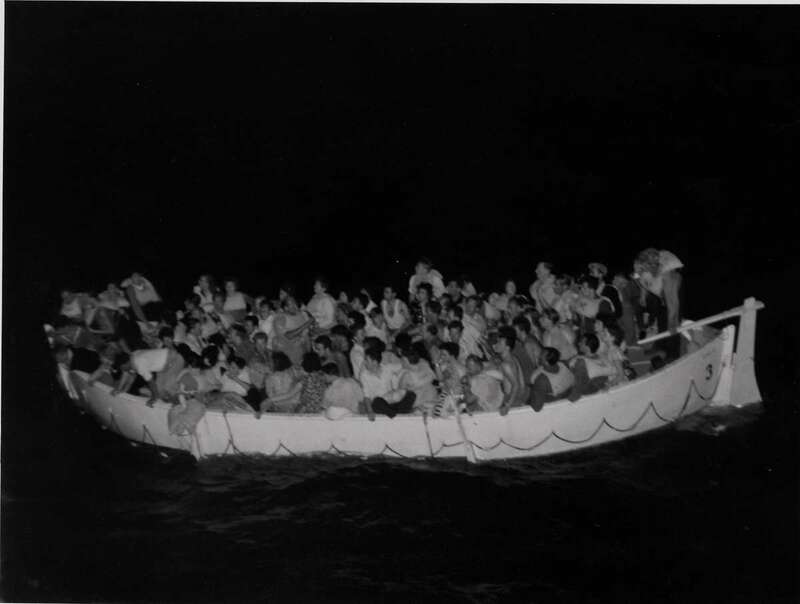 Skaubryn survivors were transferred to Aden in one of Roma’s lifeboats, 1958. ANMM Collection Gift from Barbara Alysen ANMS0214. Reproduced courtesy International Organisation for Migration. 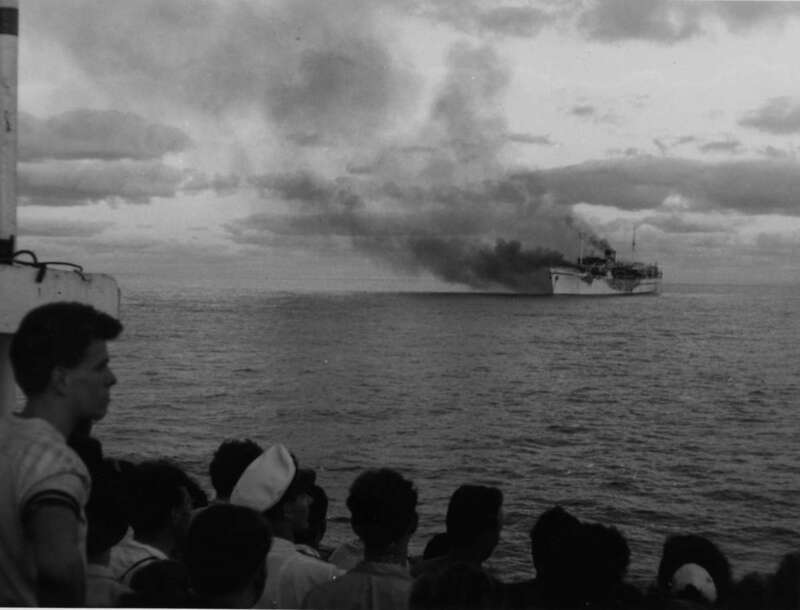 The Norwegian liner Skaubryn was the only vessel lost at sea during the era of post-war migration to Australia, when it caught fire in 1958 with 1,288 people on board, including more than 200 children. Two of the survivors, who were both eight years old at the time of their voyage, recently registered for the Welcome Wall and shared their stories with the museum. I was born in 1950, on Australia Day, in a little village in Niederbachem outside of Bonn in West Germany. I was born during a blizzard – the midwife couldn’t even get there and my father had to deliver me. My father Kurt Gabriel (1927–2006) had been in the Second World War. He was only 16 and they just conscripted the kids in those days. My mother, Johanna Heinrich (1913–1977), didn’t have anything after the war. Her first husband was killed in the war; he was blown up by a hand grenade. My half-sister Sieglinde Winkler was 10 years older than me. Life was pretty hard. Food wise, it was still very scarce. You just couldn’t go and buy a lot. A lot of farms had been bombed. We were lucky that we lived on a farm – at least we got some food there. But anything like meat was impossible. Five-year-old Ute Gabriel on her first day of school, West Germany, 1955. 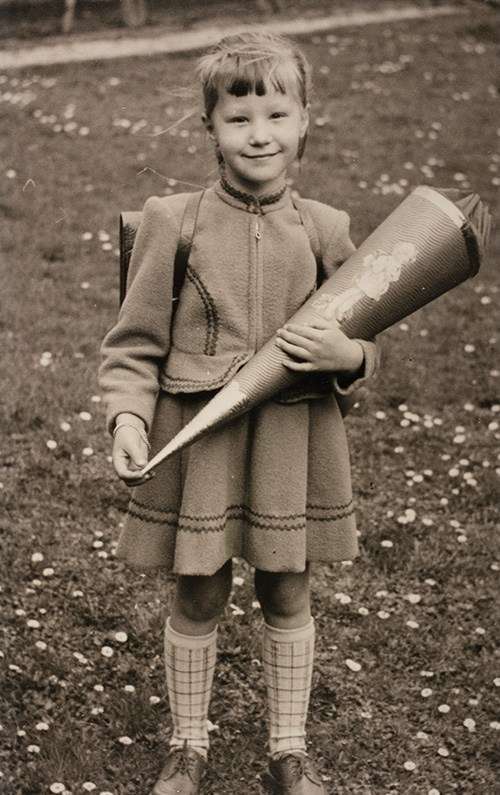 Ute carries a traditional German Schultüte (school cone), a gift from her parents containing pencils, notebooks, rulers and sweets. Reproduced courtesy Ute Mahoney. We migrated to Australia when I was eight. We had a visit from my father’s second cousin, who lived in Kingsford [in the eastern suburbs of Sydney]. My sister and mother went to work on my father to emigrate. It was either Australia or Canada. And so because a cousin was living here, we came here. I didn’t even know where Australia was till we were shown on a map. There were application forms and medical tests. You couldn’t come into the country without a clean bill of health, X amount of dollars and my father had to have a trade. He was a bricklayer – they were needed in those days. We stayed with my grandparents, who lived in Essen, for a week before the Skaubryn took off. We sailed from Bremerhaven on 14 March 1958. I remember the old-fashioned streamers thrown from the deck of the ship down to the wharf. It was all a bit frightening going on the ship. I was so seasick, totally seasick. It was all just too much. If I hadn’t had my sister, I would’ve been dead. I just threw up all the time. 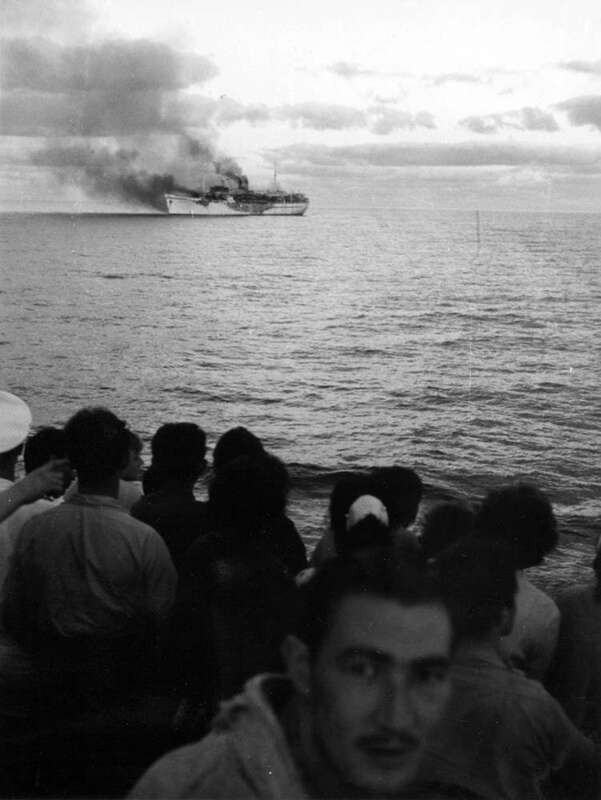 Passengers watch from the deck of City of Sydney as Skaubryn burns in the Indian Ocean, 1958. ANMM Collection Gift from Barbara Alysen ANMS0214. Reproduced courtesy International Organisation for Migration. "I couldn’t swim … I was so frightened of the water. I don’t know which is worse, fire or water. If you get caught in either of those, you’re helpless..."
We went through the Suez Canal, which was closed not long after, and that’s when the boat caught fire [a fire broke out in Skaubryn’s engine room on 31 March]. I was asleep, then all of a sudden the bells started to ring. My sister came racing in. We were separated from our parents – they were off dancing. And then they just gathered us all and put lifejackets on us. We had to stand in line waiting for the lifeboats, which was terrifying. We had an emergency drill earlier that day but it doesn’t help because everyone panics, especially women with their kids. It was just panic time to get into a boat and climb down these terrible rope ladders, which as soon as someone was on them, they moved. It was really scary because I couldn’t swim. In those days, if you didn’t live near the water, you didn’t learn how to swim. I was so frightened of the water. I don’t know which is worse, fire or water. If you get caught in either of those, you’re helpless. The [British cargo ship] City of Sydney came and picked us up. Everybody was on deck because there’s no cabins or anything there. They brought us into Aden [then a British port city, now part of Yemen] again on the Italian liner Roma. We lived there in a hospital that they’d just finished [the Queen Elizabeth Hospital] and they hadn’t put any patients in yet. We stayed there until they sent a Dutch ship, Johan van Oldenbarnevelt, two weeks later to pick us up. 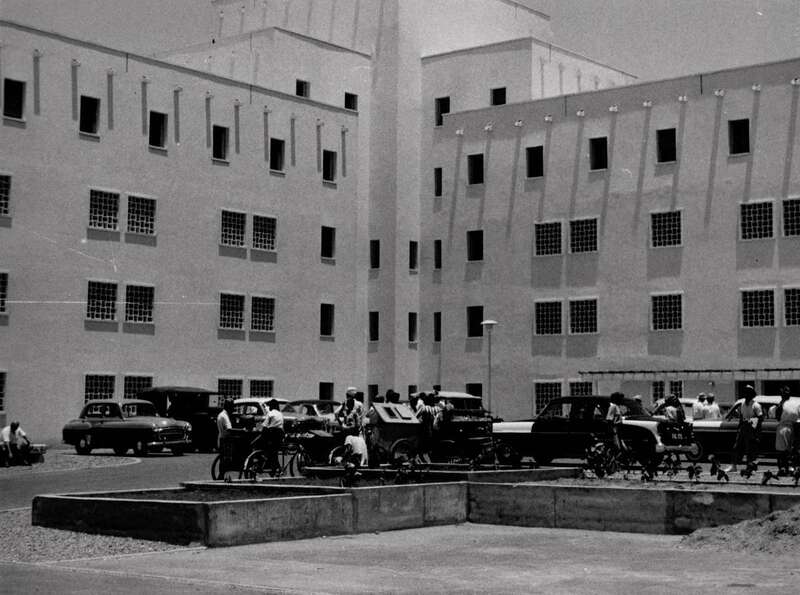 The new Queen Elizabeth Hospital in Aden, which opened early to accommodate the Skaubryn survivors, 1958. ANMM Collection Gift from Barbara Alysen ANMS0214. Reproduced courtesy International Organisation for Migration. We lost everything, all our bedding, all our china. I had a girl and a boy china doll. All gone, the whole lot. We weren’t insured – we weren’t encouraged to insure. I had a pair of pyjamas getting off the boat. And my parents were dancing so they had evening clothes on. The Red Cross put a few clothes together for us. We arrived in Sydney in May 1958. And it was lucky because, losing everything, my father’s cousin took us in for a few months [in Kingsford] until we could reorganise ourselves. We all lived in one room. My sister went off to nurse, so she didn’t have to live with us. In those days it wasn’t very popular for German people to be in Australia. As soon as the neighbourhood kids knew that I was German, they weren’t allowed to play with me because of their parents. It was hard times. It was very lonely for the first few months, until we moved to Canley Vale [in southwestern Sydney] and there was a girl my age in my street. We’re still friends these days. If it hadn’t have been for her, I would have been very lonely. 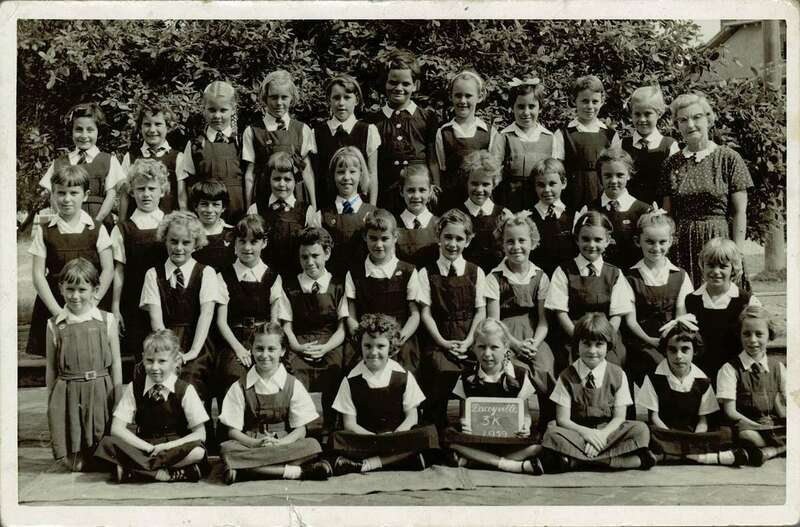 Ute Gabriel (second row from top, fifth from left) in Year 3 at Daceyville Public School, Sydney, 1959. Reproduced courtesy Ute Mahoney. My parents kept in contact with people off the Skaubryn. They always had a social group going, living in the same sort of area. They played cards together, or would go and meet at the German Club in [the nearby suburb of] Cabramatta and have dinner together, or shooting competitions. My father was often a winner in the shooting club. He was a bricklayer all his life and moved down to Cooma [in southern New South Wales] when he retired. My mother died of cancer in 1977. I married and had three kids and now have four grandkids. The Skaubryn is not far from my memory most of the time. I think about it an awful lot. 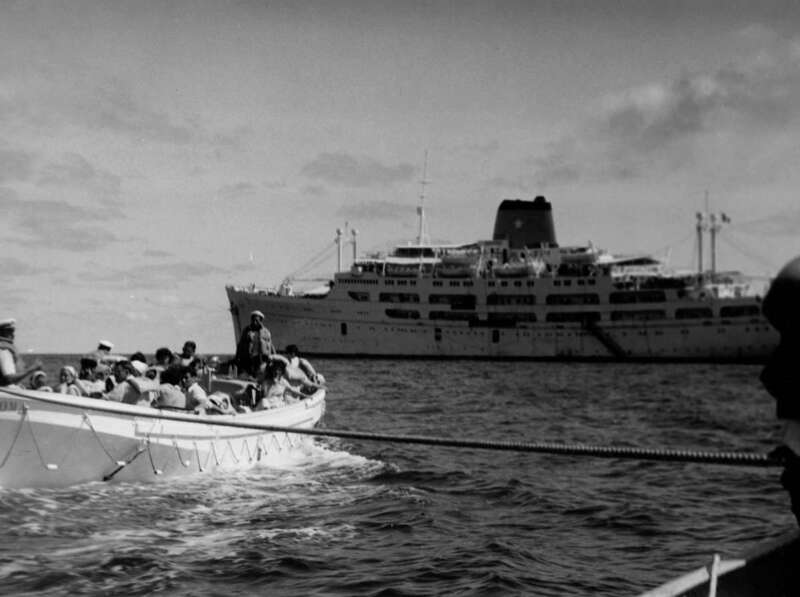 Skaubryn didn’t sink there and then [in the Indian Ocean]; it didn’t sink until they were towing it to Aden [on 6 April 1958]. I don’t watch anything like the Titanic [film]. I’m not keen on watching anything with disasters on ships, I really just don’t like it. I registered for the Welcome Wall to commemorate the bravery of my parents. I thought it was important for me too and I want my kids and grandchildren to be able to look at it and realise just what we went through to come here. I don’t know if I’d ever have the guts to move to a different country, not speaking the language or having a job to go to. It’s pretty brave and especially in that context where we lost everything. 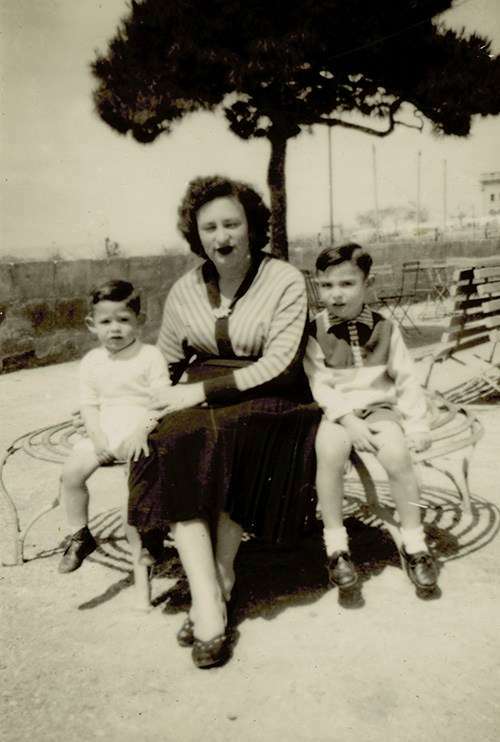 On 22 March 1958, my mother Catherine Cutajar (née de Battista; born 1927), myself aged eight and my two younger brothers, Mario (five) and Frank (three), boarded the Skaubryn in Valletta, Malta. 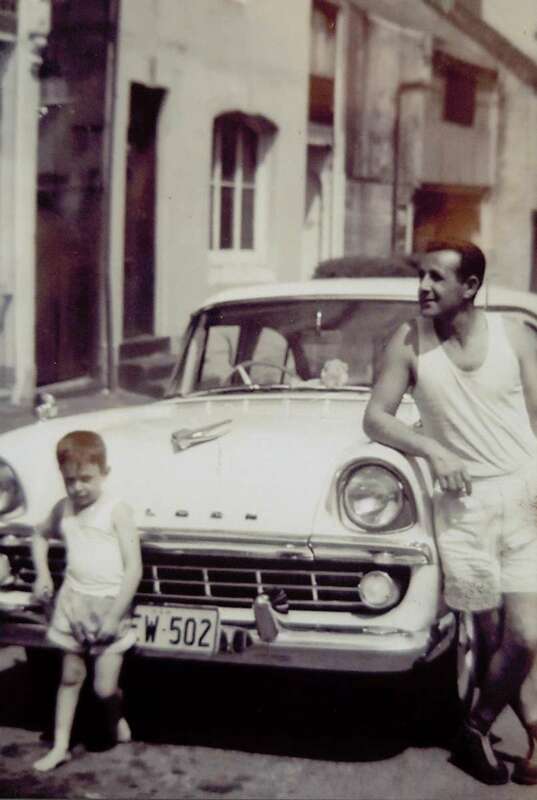 My father, Charles Cutajar (born 1928), was already in Australia – he came out a month earlier. He was a cook in the British Army. Catherine Cutajar with her sons Mario (left) and Joseph (right) in Centennial Park, Sydney, 1958. Reproduced courtesy Joseph Cutajar. I was born in Pietà [on the outskirts of Valletta] in 1950. I remember my Holy Communion when I was about five or six, with lots of parties and being dressed up. Then all of a sudden we were moving to Australia. It was a £10 passage, like the British [Malta was a British colony until 1964]. We had to go and get checks for the Australian government to accept us. My youngest brother Frank had something wrong with his legs – they were in plaster, there were some issues maybe. They were so picky at that time. I remember the hullaballoo of all the people around the wharf area in Valletta. All these people everywhere. Skaubryn was a tourist-type ship with a mix of passengers, mostly German and Maltese. The first week was uneventful. Then on 31 March, Mum was at the movies with a friend and we had a babysitter. We boys were woken up by smoke filling our cabin. I think the babysitter went looking for Mum and they must have panicked. Mum grabbed my brothers, Mario and Frank; a man (a family friend) grabbed me. This guy just pulled me out of the bed basically. I was taken and put in a lifeboat, separated from my family. In the lifeboat people were screaming and vomiting. I was terrified. In my eyes, as a child, the lifeboat was overloaded. I could see sharks circling the lifeboat and the Skaubryn burning. A lifeboat from Skaubryn in the Indian Ocean at night, 1958. ANMM Collection Gift from Barbara Alysen ANMS0214. Reproduced courtesy International Organisation for Migration. It was a clear night with a calm sea. That’s what really stuck in my mind. It was like daylight – the moon was so bright, the ocean flat. If it was really rough, a lot of people would have drowned. One German man had a heart attack and died [he was the only casualty of the Skaubryn disaster]. "Some people had been dressed up for dinner and the movies, while others were in pyjamas. We had nothing except the underwear we had on..."
Some people had been dressed up for dinner and the movies, while others were in pyjamas. We had nothing except the underwear we had on. We lost everything basically until we got to Aden and they gave us money. People tried to take their bags onto the lifeboats, but the sailors were throwing them overboard into the water and saying, ‘The people before the bags.’ I remember some things floating around in the water. And I definitely remember looking back, seeing the Skaubryn alight. We were first picked up by an oil tanker. I can’t remember how I got up there – I remember feeling the rope but I don’t know whether I climbed or somebody pulled me up there. And then I didn’t see Mum until she found me. She was on another lifeboat, separate to me, with the other two boys. I was alone, I don’t know how long for, but it seemed like ages to me. Mum was terrified – she never left our sight again. On the oil tanker, they gave us food of some sort to eat and blankets to put around us, because we were in underpants and singlet tops. Later we were transferred to Aden on the Italian ship Roma. When we arrived in Aden, we were taken to the local hospital to wash us. The Australian government gave us some clothes and some money, about £50. They gave us food and documentation so we could continue our journey to Australia on the Orient liner Orsova. We arrived in Sydney in April 1958. It took four ships to get to Australia. Dad’s sister Nina and her husband Joe were living at La Perouse [in Sydney’s south-east], so we stayed with them until we got settled. They had three girls and five boys. And us three boys, so it was a bit crowded! 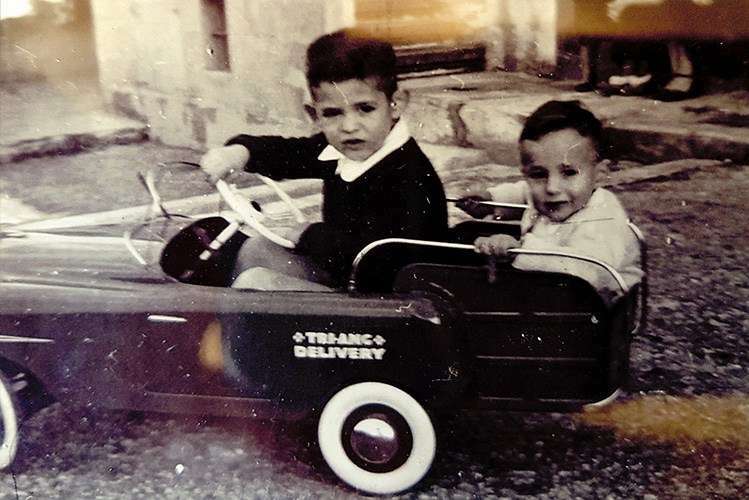 Brothers Mario Cutajar (left) and Frank (right) in Malta, early 1950s. Reproduced courtesy Joseph Cutajar. We went to school in La Perouse. Then we shifted from there to Surry Hills and then Paddington [both in inner-city Sydney]. My cousin got Dad a job at the Bunnerong Power Station in Matraville [in Sydney’s south-east]. When they closed Bunnerong, Dad chose to be transferred to the Tallawarra Power Station [on the south coast of New South Wales] and we moved to Wollongong. After school I got a job at Port Kembla Hospital as a kitchen hand. My boss was a single man who left Germany on his own at 19. One day we were just talking about things in history, our backgrounds, and then we discovered we were on the same ship! After that I worked with Dad for 15 years in the power industry, then I went back to the area health service where I have been for 40-odd years. My wife Susan is English. Her family also came out as £10 Poms and her father ended up working in the steel industry. We have two children and four grandchildren. Charles Cutajar with his youngest son Frank in Paddington, Sydney, late 1950s. Reproduced courtesy Joseph Cutajar. The Skaubryn fire has affected me somewhere along the line. Before I went on another ship in the 1980s, I kept avoiding it and thinking about it. The first ship I went back on was the older Fairstar. I got on and thought, ‘It can’t happen to me again.’ When I hear about other tragedies, I think about how lucky we were. We might not be here. On another cruise, I met a German fellow and we started a conversation about the Costa Concordia [the Italian cruise ship that sank in 2012]. He was also a passenger on Skaubryn and remembers the water in the swimming pool boiling from the heat of the fire. The fact that that guy was on the same ship really concreted in my mind what I did see that night. It wasn’t a child thing that I thought of – it really did happen. When the Titanic exhibition was here [at the Australian National Maritime Museum], there was a display on boarding passes and our name was on there, in a section about ships that sank in the past. After seeing our names, I just kept thinking, ‘We’re in history.’ I decided to put our names down on the Welcome Wall as we’re part of history and it’s something for the grandkids to see when I’m gone. This article also appeared in Signals Magazine (Issue #122).